A joint CII-Antrix – Deloitte on the New India Space Market Study was released by Mr K. R. Sridhara Murthi, Managing Director, Antrix Corporation Ltd., at the Bengaluru Space Expo (BSX) 2010 conference organized by Confederation of Indian Industry (CII) and Antrix at Banguluru. Despite the global recession and expectations of reduced spending by many global governments on military, defense and security technology acquisition, India’s space industry is expected to rise substantially, according to a newly released study by CII Antrix and Deloitte. 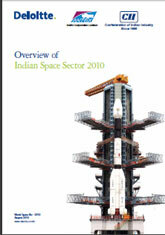 The Indian Government space budget of `57.78 billion ($1.26 billion) for 2010 has increased by an estimated 22% from the previous year, and amounts to 0.14% of GDP. From 2003 to 2010, funding has increased 144% from `23.68 billion ($ 0.51 billion). The study found that the space spending is expected to increase further by an average of 14.8% annually over the next four years and estimated to be `100 billion ($2.17 billion) by 2014. Currently, I India is ranked sixth globally in terms of space budget and technological capabilities, behind the US, Europe, Japan, Russia and China. The report also provides insights regarding global and Indian space activity, the present state of Indian industry, trends for future development and opportunities and business potential for the industry.